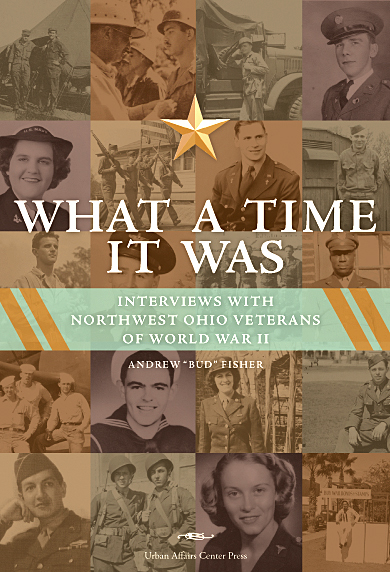 Those are just snippets of three of the 80 interviews with members of the “Greatest Generation” that appear in What a Time It Was: Interviews With Northwest Ohio Veterans of World War II, a book published today by The University of Toledo Urban Affairs Center Press. The book was compiled and edited by U.S. Army veteran and UT alumnus Andrew “Bud” Fisher, a volunteer for the local Veterans History Project that’s archived in the Ward M. Canaday Center of Special Collections in Carlson Library. Fisher interviewed some 500 area WWII veterans, a feat honored by the Library of Congress. He spoke with men and women from all service branches and both the European and Pacific theaters of operation, in addition to the home front. The book’s appendix lists all the interviewees, whose recordings are housed in the Canaday Center. In many cases, veterans who’d never shared their wartime experiences with their families would open up for Fisher. “Afterwards, receiving a copy of the audiotape for the family was important to them,” he said. Dr. Tom Barden, professor of English and director of the UT Honors Program, who helped edit the book, noted the confluence of its publication and the Nov. 11 dedication of the Veterans’ Plaza on Main Campus. “It’s an ideal match,” he said. What a Time It Was will be available for purchase for $25 following the 11 a.m. Veterans’ Plaza dedication at a table inside the Memorial Field House. It also can be ordered online from the Urban Affairs Center at http://uac.utoledo.edu/Publications/uac-press/WhatATimeItWas.htm. Shipping and handling is $1.35. An option for credit cards will be available soon, as will copies at the UT Bookstore and UT Medical Center gift shop, and at Borders Books. This entry was posted on Monday, November 9th, 2009 at 5:22 am and is filed under Features .